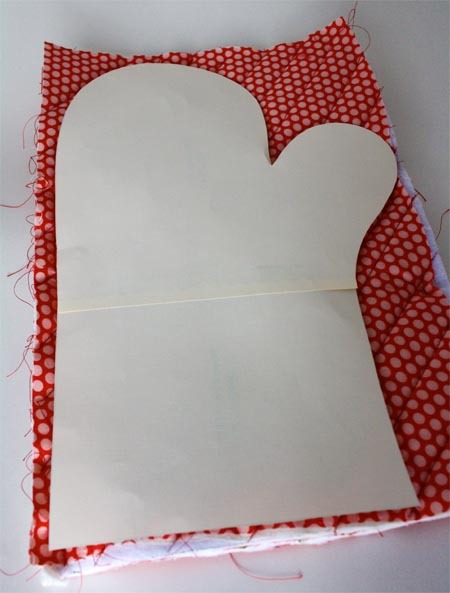 If you are still hoping to manage a few handmade gifts, this oven mitt can be whipped up quickly. Package with some of your favorite recipes for a the perfect handmade gift! Sandwich cotton fabric (lining) right side facing down, Insul-Brite, cotton batting, cotton fabric (0utside) right side facing up. Sew together in stitching pattern of your choice. I made diagonal lines about an inch apart. Repeat for other set of rectangles. 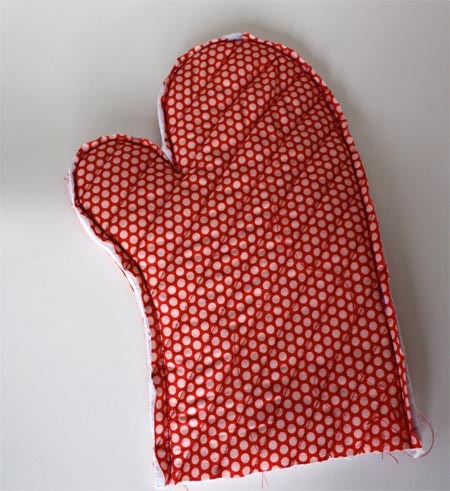 Download oven mitt pattern top and bottom. Print patterns and tape pieces together. Stack the two quilted pieces on top of each other, right sides together. Place pattern on top and draw around the pattern. This is the stitching line. Stitch. I reinforce the thumb area so I can trim and make a slit right up to the stitching line. Cut. Clip curves where necessary. Cut a contrasting piece of fabric 7″ X 15″ for the band. Iron piece in half lengthwise, then open and bring edges to the center and press again. Line edge of binding up with bottom edge of the oven mitt, right sides together. Turn edge up and being sewing in the first ironed crease. Stitch all the way around, folding end over when finished. Fold in the other half of the binding. Stitch all the way around in the ditch between the two fabrics, making sure to catch the binding on the inside. 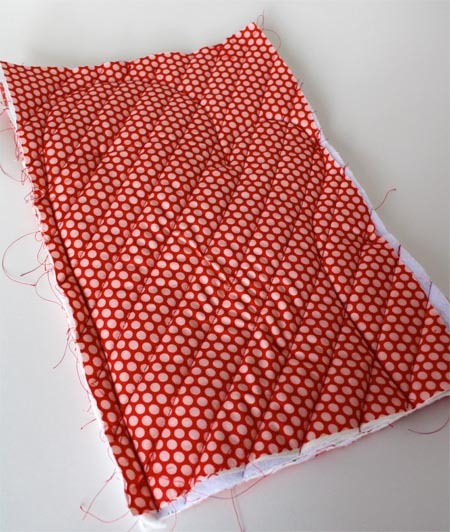 Stitch along the place where the binding overlaps with one straight stitch, or whip stitch it closed by hand. I loved this oven mitt! Both my son, and my son-in-law do alot of grilling. I am always making their wives something, so when I saw this pattern, I immediately thought it would be a great Christmas gift for the them. Thank you so much ! You need wider fabric that 9" or it is a huge fail. So happy you like it Shirley! This is the 5th oven mitt pattern I have tried as I'm looking for one to use to make Christmas gifts for my grown sons and some other family members. This is the winner and my search is over! First, the size is great. The mitt is sized right for both women and men, it seems, and the length is perfect. I love the wide cuff and its so easy to attach. I just topstitched mine about 1/4" from the edge and it caught the inside beautifully. Stitching before cutting out the shape is pure genius! So glad I found this!! Thanks!! I hope you are still willing to respond to comments on this post. I just made one of these mitts. It turned out pretty good except it was too small to fit on the arm of my machine so had to do the band by hand. I will adjust my sizing next time. But I have never quilted before this. 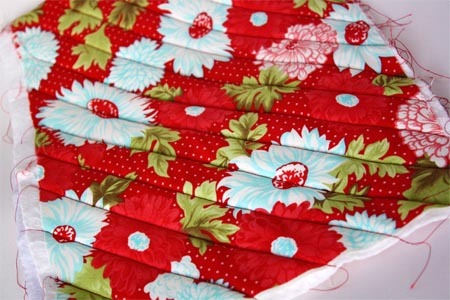 Is there a secret to keeping the layers from shifting when you sew them together? I pinned, but still shifted some. Is there a special foot I should be using? Thanks for any answers you can provide! hair loss is reversible and hair loss treatment herbal can be helped. Thank you so much! I just made my first pair of oven mitts. :) I didn't have enough fabric for the wide trim, so I had to modify, using 5" x 15" strips. They look just fine. I recommend cutting wider rectangles to begin with. I found that, after quilting, my "sandwiches" were just a bit too narrow (and distorted) for the pattern. I adjusted, but one downside was that the first one came out too narrow to fit on my sewing machine's small arm. I put the binding on by hand. Next time I'll add at least half an inch to the width. @Holly: That may be what happened to your mitt. I did the first set of stitching with a small backstitch, and then used a running stitch-in-the-ditch to finish it. I quilted along the vertical lines in the fabric. I can't figure out how to add the contrast binding strip! The mitt will not fit far enough on my machine to sew! What did I do wrong???? Just curious before I start this fun project...when I click on the download button to print the template, the image automatically comes up at 130%. Do you intend it to be this big, is it my computer, or should I reset it to 100% before I print it? I don't want the mitt to be too small...or too big! I made these using this tutorial and it was a great success! I am a total beginner in sewing but these instructions made it super easy so thanks! My husband is so exited to have oven mitts that fit him! 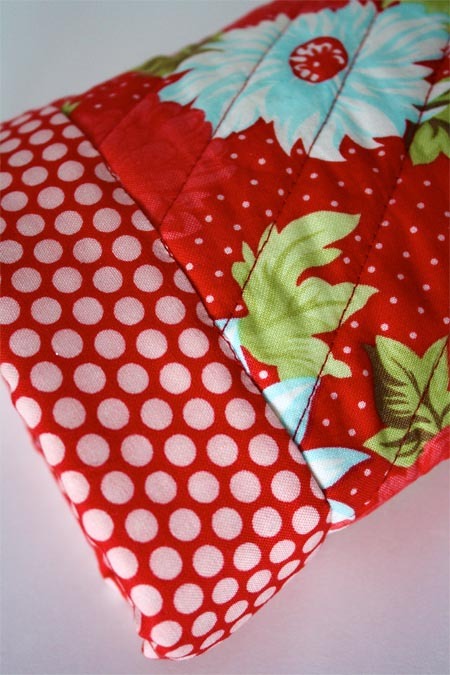 I like your idea for using a second fabric to finish it at the bottom instead of a bias tape edge. Thanks so much for the idea. I was looking for a good oven mitt pattern and you kindly provided it. Thank you so much. 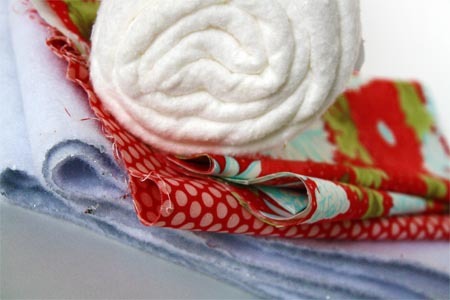 If you are having trouble sewing the layers together, make sure your needle is sharp (put into a new needle). You might also try a heavyweight needle like you would use for denim. I had the same problem as Amanda mentioned above. Any advice? I was hoping for an easy project but unfortunately hasn't turned out that way. Hello! 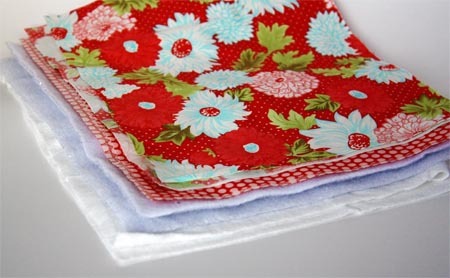 I have a very beginner question about quilting. 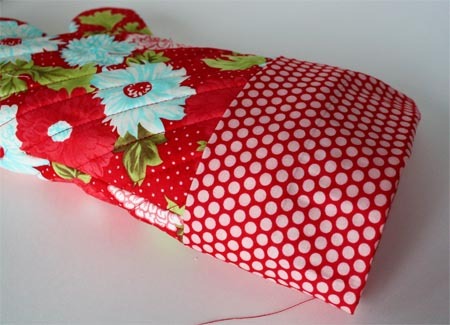 Do I need a separate foot for that or can I use the basic sewing foot that came with the machine to do the quilting part of this oven mitt? Thank you! This is sooooo cute! I just stumbled across your site and love it! Thanks for the info on how to make this. I'm putting it on my "to do" list! 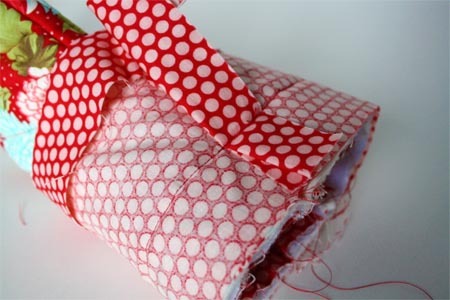 Thanks for this great tutorial and for including the pattern! I never thought to use a wide binding. I think I'll do a zigzag stitch around the edge after cutting. One batting and insul brite is enough for an ovenmitt? I like your approach. Thank you for sharing! This tutorial was amazing, thank you so much. Very easy to follow for a newbie like me!!! And thanks for mentioning about needing the cotton lining, I forgot it when I went to the store and was going to ask if the insul-brite is enough. I guess I'll just be cutting tonight and going back tomorrow...oh well :) Thanks for the tutorial! You are right I did forget the loop! I didn't realize until I was finished! 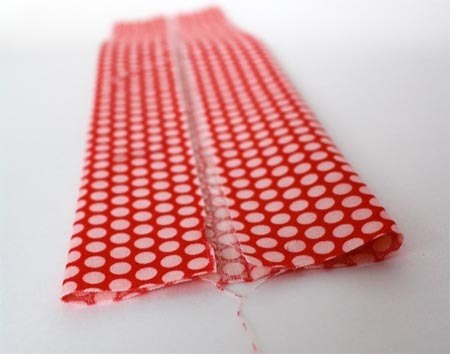 You may place a fabric loop 2 inches up from the bottom in the side seam. Make a loop by cutting a rectangle 3" X 4". Fold piece in half lenghtways, press. Open up and fold each edge to the middle, press. Fold in half, press. Stitch along both edges. Have you ever used Flannel as a lining? Denim as a lining? I have heard of it being done. Is it a good idea and safe? Thank you. I haven't used any of these lining. I do know that using the insul-brite alone is not enough heat protection. 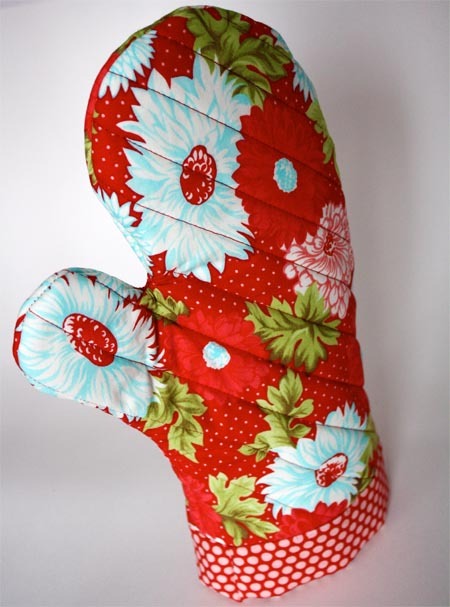 Very Please you updated the oven mitts pattern adding insul bright and batting and saying the order they go in. Thank you so much. I'm having a hard time with the V between the thumb and fingers. Eveytime I turn it right side out you can see the stitches stretching and it's a little bunched. Any suggestions? The area between the thumb and first finger can be difficult. I pivot and re-enforce that area a couple of times. I then clip as close to the stitches as possible. I also clip going up the thumb and finger a bit. You can also stitch more of a curve in that area, re-enforce and clip. A little bunching is expected, but clipping should reduce it. If you check a store bought mitt you have at your home you might notice slight bunching in that area. I've been looking for a pattern and tutorial on an oven mitt. This is great. Thank you for sharing! Thanks for the clear cut tutorial. I have made some ofe these but they came out a bit small bequase I quilted them after cutting the mitts out. Now I know to quilt first. I had the same problem with a caserole carrier I cut out and have had a struggle making because the batting pushed the linning ot of the seam as I stitched up the seams. Now I know to trace the pattern on my fabric. Layer it all together Pin it thoroughly or quilt it and/or stitch around the pattern before cutting it out. 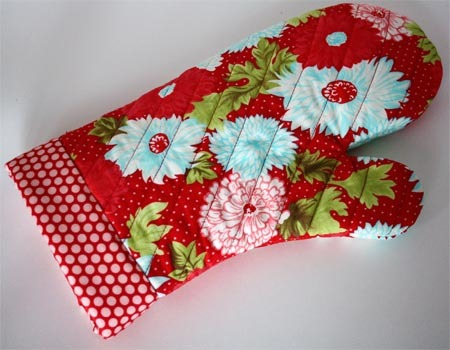 I love the look of your oven mitt and you make it look so easy that I want to give your pattern a try! Thanks! your mitts are so lovely! 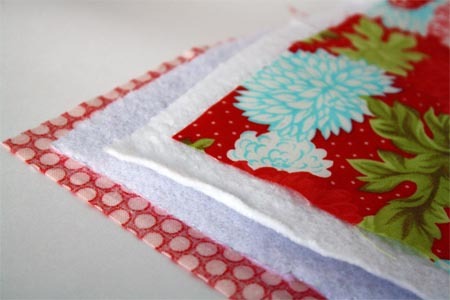 I want to make these to go along with some hotpads I'm making my mom for her birthday! To those who were wondering, this is the bliss fabric line from moda. I love it! Carla, make sure your Adobe Acrobat reader is up to date. You could also try saving a copy to your computer and then printing from the saved copy. Love the fabric! Would you tell me which ones they are? I know I've seen the designer but can't think who it is. Any help would be appreciated--and thanks for everything you do and share! I'm so glad you posted this! I had forgotten that I wanted to get my mom some new hot pads for Christmas. She's still using some that she had when we were kids! I love this post..I would love to try..but that would require me leaving the house to get fabric...it's crazy out there ;-)....I will have to try after the holiday. Love it Cindy. 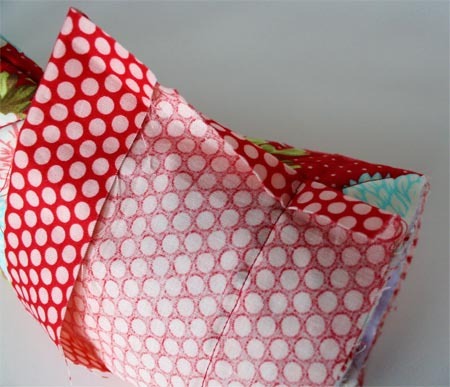 I've got a kids version on my website, there is nothing cuter than homemade! If you make these, you might want to use them to play my Merry Christmitts game! cute oven mitts! I've got all those things in my stash, and need new oven mitts! I know what I'll have to make after Christmas!